Should I write something? Maybe I'll write something. Don't get used to it. But if I'm going to post thoughts on the message boards I might as well just do it here. A season that began with (optimistic, IMO, since I wanted to see who would score for this team) national title aspirations on the heels of a Frozen Four appearance last season ended with a whimper, with the Wolverines getting swept out of the first round of the Big Ten Tournament by the Minnesota Golden Gophers. So ends one of the strangest seasons that I can remember. Out of the gate, the Wolverines put a ton of pucks in the net, and allowed a ton of pucks into their own net. Through the first 11 games, they averaged 3.72 goals per game for, which over a full season would have put us as the #4 offense in the country, but averaged 3.81 goals allowed, which would be the third-worst in the country. After the series at Penn State, however, something really weird happened. Despite not changing anything about their system (just re-dedicating themselves to defense), pucks stopped going in at both ends of the ice. Over the next 11 games, they scored 24, allowed 24, which would have put them as the 9th-worst offense and the 11th-best defense over the course of a season. They went 2-3-6 over that stretch, including a brutal 0-2-4 stretch of series against Wisconsin, Michigan State, and Minnesota, with 5 of the 6 games at home. You'd have hoped to win 5 of those games, and they in fact got 0. Michigan had a pair of good efforts (both ties, shocking) at the Great Lakes Invitational, but ultimately the death blow to the season occurred out in Vancouver at the World Junior Championships where, for the second straight season, the Wolverines lost one of their top forwards for the season--this time their top forward, Josh Norris. They came back with an inspired win in the outdoor game at Notre Dame, but any hope of a North Dakotian second half came crashing down with an unforgivable, uninspired Tuesday night loss to 55th-in-the-Pairwise Merrimack. Beyond that, a lot of inconsistency, and a horrifically frustrating two-overtime-losses series against Wisconsin when they could have nailed down home-ice advantage in the first round of Big Tens. All in all, they swept 2 series the entire year (and one was against 59th-out-of-60 St. Lawrence) and only won back-to-back games on three occasions. They played 11 overtime games and won 0. They won the season series with Big Ten Champion Ohio State and lost to two teams that didn't make the Hockey East tournament. They never settled on a goalie until they were pretty much forced to in the playoffs, despite Hayden Lavigne ranking dead last in the nation in save percentage. (Mann is 66th out of 75.) The special teams were both in the bottom third of the nation. No one really stepped up to replace the DMC line's scoring. Lockwood and the Pastujovs had small jumps in scoring over their career pace, but nobody made that Tony Calderone (18 points to 45), that Cooper Marody (15 points (30ish pt pace) to 51), the Dexter Dancs (12 points to 28), the Tyler Motte (9 goals to 32) jump. Becker stayed the same, Slaker stayed the same, Winborg has gone from 16 points to 8 to 5 in his three years, Cecconi's offensive production went down, Hughes stayed the same. It really felt like Michigan was just missing a couple of the snipers that they've had for pretty much all of history. Their Corsi numbers were great (2nd in shot attempts, 9th in Corsi For %), but, despite being tied for 1st nationally with Penn State in "close" shot attempts and 3rd in shots on goal from in close, they scored 27 fewer close goals than PSU and despite a 55.4% Close Shots For %, got outscored 51-42 in close, which was 41st in the country. The freshman class just wasn't that good. That's a ten-man freshman class and they combined for 19-37--56, or 16 fewer goals and 15 fewer points than Kyle Connor had on his own in 2015-16. Now, there was no Connor in this group and there were some productive players/players that improved throughout the year -- I love Blankenburg, Moyle and GVW fit in great with Raabe, Summers chipped in 11 points and was a + on a team that didn't have too many. Lambert had a couple of good weekends down the stretch (though he had a horrendous Friday night in the tournament). It also really hurt that some guys who should have been playing for them weren't playing for them at the end of the season. Josh Norris was on a 21-goal, 40-point pace, which would have led the team going away and would have put him somewhere around the top 5 in goals and top 10 in points nationally. He was having a breakthrough season and his injury was just killer. Our PP was 19.8% with him, and 10.3% without him (which would be worst in the country over a season). Bode Wilde was the star of the freshman class and they couldn't get him into school. He ranks 3rd in the OHL in points among defensemen. Add in Luke Martin missing the stretch run, and that was no bueno. So where to from here? 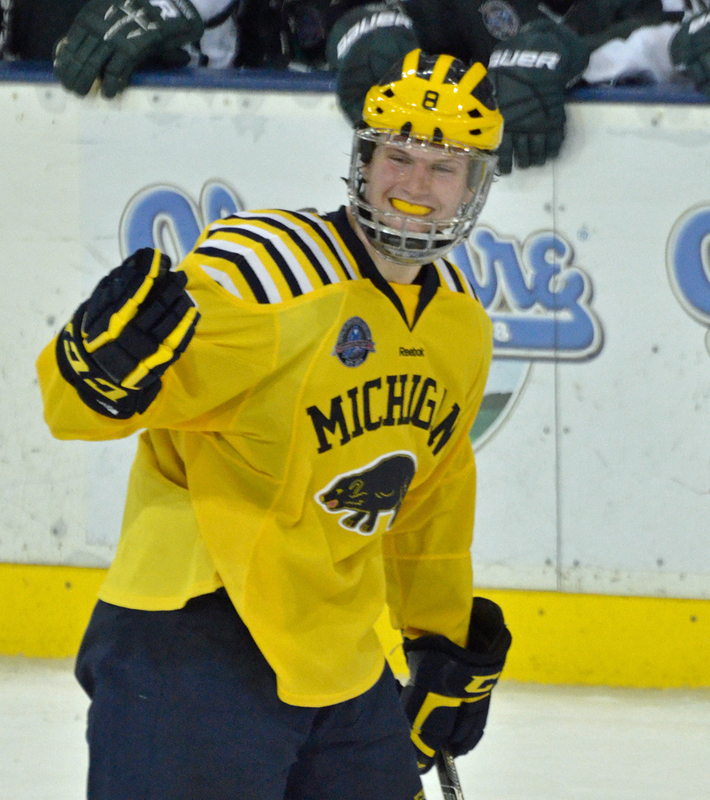 Michigan's fortunes for next year hinge quite a bit on what their sophomores and juniors do. Hughes is most definitely leaving. Beyond that, though? You've got Norris, who I would have expected to go before his injury, also with the drafted juniors in Lockwood, Martin, and Nick Pasta. If all those guys come back, Cam York (projected top 15 pick) does a reasonable Quinn Hughes impersonation, Emil Ohrvall proves to be the sniper they're missing, and John Beecher comes in as that big center we could use, then they'll have a shot to be good. If all those guys bail, next year is going to be interesting-not-in-a-good-way. I love Lockwood, but out of the juniors I think it's critical that Martin is back. If he leaves then you're replacing Hughes, Cecconi, Martin, and Boka. You'd have Luce, Summers, and Blankenburg back. That'd mean 3 freshmen in the lineup and you're praying to God that Cam York makes it to campus. Beyond that, you're hoping for Lambert, Moyle, et al to continue developing. I think Blankenburg is going to be really really good. He hasn't been playing defenseman for very long but didn't look out of place and led the team in +/-. He can fly and hopefully his background as a forward will lead to some additional offensive punch. Moyle had 7 goals on like 30 shots, so maybe he's a guy that can take a leap as well. Lastly, they have to find someone who can stop the damn puck. As I mentioned, Lavigne was last in the nation at actually stopping pucks that were shot at him. Mann's numbers weren't better, but I thought he was outstanding against Minnesota on Friday night and had some really nice games down the stretch. He only gave up more than 3 goals in 3 of his 14 appearances (12 starts) after mid-November and, frankly, I thought they should have played him more. I still think he has a chance to be good if they can get him to slide himself out of position a little less and curtail some of the really soft goals. We haven't had a goalie in 15 years aside from Hunwick, who they got more or less by accident. Gotta find someone who can stop a puck. That's enough for now. I'm not going back to writing game previews or game recaps, but I'll chime in when I have things to say.